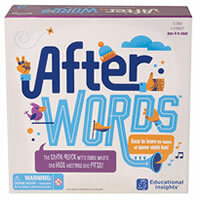 After Words is considered "the think-quick word game where the last becomes the first." That's because you'll be tasked to think of words that start with the letter that your last answer ended with. For example, if a card reads "something used to build a house" and your answer is "hammer" then your next answer must start with an "R". Vegetable? - radish. This fun, quick paced game is great for the family and is also a great educational tool as you'll be thinking about letter sounds and spelling. Be sure to check out the official game rules and instructions below to learn how to play After Words. Go ahead and add After Words to your game library and you'll be glad you did. If you can discard all of your cards you'll win. You get a folding game board, 100 category cards, an electronic timer and the official After Words game rules and instructions. Please keep in mind that the official After Words board game rules and instructions could be different depending on the game version you have. The rules below are some of the exact directions on how to play After Words. Share with us your comments, funny stories, tips, advice, strategies, creative ways to play, questions about how to play, problems with the rules or anything you want about After Words. All submissions will be reviewed within 24 hours. Click here to add your After Words comments.